CM Trailers – More than just a name. Whether you spend your days on a ranch, farm or job site, you need a hauling product that is sure to outlast even the toughest circumstances. Specializing in top-grade horse and livestock trailers, CM Trailers manufactures a trailer that is made for you. CM Trailers are designed to meet the needs of any rural lifestyle, from the weekend trail rider to professional livestock haulers and showmen. We even offer a full line of cargo trailers! So go on – ride along with a CM Trailer. CM Trailers offers over 25 years of experience in manufacturing robust steel and all-aluminum trailers that you can count on. 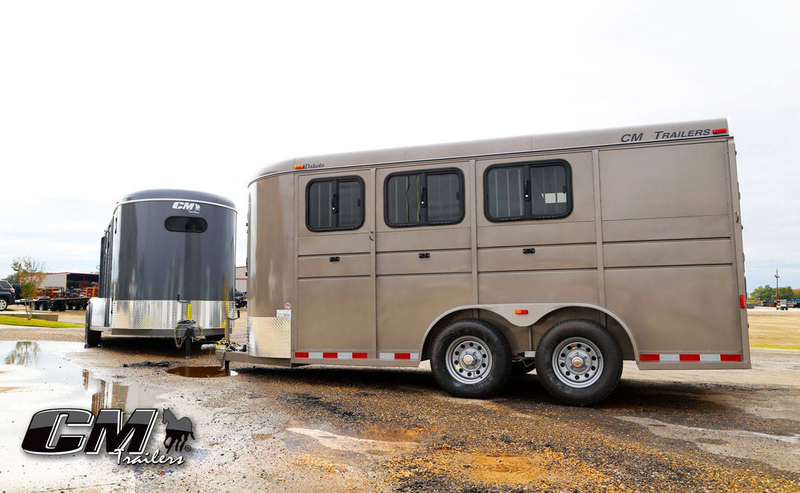 Whether you’re taking your prized horses to the arena, transporting cattle to the stock yard, or bringing tools to the job site, CM Trailers is a name you can depend on. Committed to safety, CM Trailers has been known for years as a leading brand for safety, structure, and longevity – all at a price you can afford. That’s why all CM Trailers are NATM Certified and are compliant with federal D.O.T. standards. At CM, we also listen to our customers and their ever-changing needs. With durable steel and aluminum builds, a 3-year limited warranty, and industry leading finish process, your CM Trailer will retain its value and maintain its appeal year after year. We’ve got you taken care of. Built sturdy from the ground up, CM Trailers are manufactured to be rust resistant and feature superior welds for added strength. Tough, dependable, and featuring eye-catching good looks, CM Trailers offers exceptional durability and best in-class safety. Combine these features with our fast and friendly nationwide warranty, and you’ll see why so many horse and livestock enthusiasts choose CM Trailers for their hauling needs. So go ahead – embrace the spirit of the West and allow CM’s best-in-class trailers to carry you forward!